Anywho, I am loving Lauren and Kent, even though Kent's facial expressions are a little over the top :) What I want to talk about is THE dance Kent did at the end of the show with Neil (the other love of my life...been a fan of him since his season & OMG he is so unbelievably beautiful...& yes, hubs knows my fascination with him, so it's no secret lol). <---Ya like that long run-on sentence? Ha, thought so :) ANYWAYS- I'm so bad at rambling - It was such an AMAZING dance. I get goosebumps everytime I watch it. Travis Wall choreographed it, and my goodness, that boy is out of this world talented. It's absurd. It's sick. I'm thankful. Great right? I'll for sure be tuning in tonight, and my guess is that Adechicke' is going to be dunzo. But, hey, ya never know. OH! I also wanted to tell you guys about my cup. Cup, you ask? Yes, cup. I am obsessed with it, and I find myself drinking SO much more water than I used too. It's resusable, dishwasher safe and cute :) I found mine at Bed Bath & Beyond, but I think they have some similar at Starbucks too. They have those cups at Target too! I LOVED the show last night. Lauren & Kent are my faves too, for sure. He is adorable! I'm anxious to see who gets sent home tonight. Thinkin' it should be Adecheke, what about you? I am obsessed with Robert! He is my Neil :o) I don't think he'll win (I think Kent will win) but I REALLY, REALLY hope he's in the final! Nice to see someone who is equally obsessed with the show! Loved that dance! I haven't been watching the show this season and I wish I had! Also I have been wanting one of those cups for so long now! I just don't ever see them. 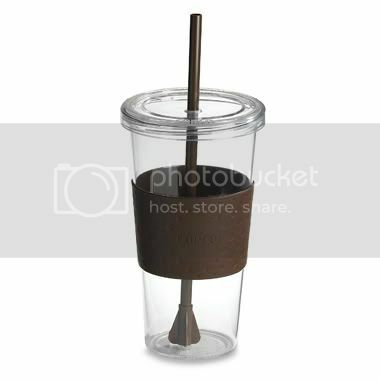 I don't go anywhere without my Starbucks reusable cup... love love love it! Well hopefully I hear from ya!